Arguably the loveliest all Crocosmia species, C. masoniorum deserves to be more widely grown than it is. Rare in the wild, it has nevertheless contributed to some of the most spectacular garden cultivars and hybrids. A deciduous, bulbous plant, growing up to 0.8 m high. The stiff leaves are lance-shaped and longitudinally pleated, 25-50 mm wide. The stem is inclined with the flowering spike held horizontally so that the dense inflorescence is presented in a showy arc. The bright orange flowers are widely funnel-shaped with spreading tepals; the floral tube is 18-25 mm long and the spreading tepals measure 18-30 × 5-12 mm; the stamens are suberect in the centre of the flowers and gently arched, 30-35 mm long. Plants flower in summer, from December to January. The species is rare in the wild, although it may occur in other suitable habitats along the Eastern Cape Drakensberg Mountains but these are difficult to access. In at least some localities the invasive black wattle, Acacia mearnsii, is choking the habitat. Crocosmia masoniorum is known from just a few localities in the mountains to the north of Encobo and Umtata in Eastern Cape. Here the plants grow on shaded, wet rock ledges at the head of mountain streams. In its natural habitat the species experiences a cool, temperate climate with abundant summer rainfall and a dry, cold winter. In cultivation it is cold-hardy down to -25°C. The species is named in honour of the Edwardian artist, Marianne Mason and her brother Edward Mason, of St Bede's College in Umtata, who collected the species in 1911. Plants were cultivated at the Cambridge University Botanic Garden the following year from corms brought to Britain by Marianne Mason. This original introduction did not thrive, however, and the species appears to have first been used for hybridization only in the latter half of the twentieth century. Until then the cultivated montbretias (an earlier name for Crocosmia ) were derived from complex hybrids between three other species, C. aurea, C. pottsii and C. paniculata. The genus Crocosmia, comprising eight species, is concentrated in eastern South Africa, where six of the species occur, with another endemic to Madagascar. The genus is largely found in temperate and subtropical climates, with just C. aurea extending into tropical Africa. Curiously, one species, C. fucata, is restricted to a single mountain massif in winter rainfall Namaqualand, far to the west. Of the species, only C. aurea is cultivated to any extent, and the hybrid between it and C. paniculata, known as C. ×croscosmiiflora, is widely naturalized throughout the warmer, humid tropical and subtropical parts of the world. It has even achieved the status of a weed in some places. Several other hybrids with C. paniculata are popular in British gardens, some involving C. masoniorum. The showy flowers of C. masoniorum are possibly pollinated by swallowtail butterflies but this has not been observed. The widely funnel-shaped flowers with their conspicuous stamens are ideally adapted to attract these large insects, and similar-shaped flowers elsewhere in South Africa are known to be pollinated by them. 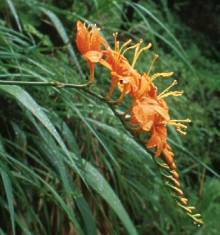 None of the Crocosmia species appear to feature in traditional medicine but are important horticulturally. C. masoniorum was crossed with C. paniculata in the second half of the twentieth century by the British gardener Alan Bloom to produce the hybrid 'Lucifer', which is still one of the most popular of all the crocosmia hybrids. Since then many others have been raised but the genus is still mainly popular in Britain. The elegant and showy flower spikes of Crocosmia masoniorum make it an ideal companion plant at the edges of herbaceous borders, where they are allowed to arch over lower plants. The bright orange of the wild plants is a brilliant foil for both dark purple and red flowers or foliage, and also for silver foliage. A yellow-flowered form, 'Rowallane Yellow' and an apricot one, 'Rowallane Apricot', are also available. Plants require full sun to perform at their best and prefer well-drained but moisture-retentive soil, enriched with organic matter. Plants should not be disturbed for several years or until they begin to perform poorly. Certainly it appears that corms derive some nutrition from the persistent corms of previous years and these should therefore not be broken off. Plants can be propagated by division of established clumps in spring or by seed. C. masoniorum has been reported to be susceptible to excessive damp in winter but thrives in my garden in Cape Town, where the winters are cool and moist. However, it is planted in a thick herbaceous border which may prevent the soil from becoming waterlogged for extended periods. Adequate moisture in summer is necessary for good flowering and in dry conditions the flowers may abort and the leaves become infested with red spider mite. In the winter the corms should be kept slightly moist and not allowed to dry out. Golblatt, P., Manning, J. & Dunlop, G. 2004. Crocosmia and Chasmanthe. Royal Horticultural Society Plant Collector Guide. Timber Press, Portland.